Slow lifting and static contraction training are radical tempo-related weight training. These weight training methods have actually been around and practiced much more than most people realize. They aren’t going anywhere because they do produce results, sometimes amazing results. This having been said, these are not the end-all training systems that will forever change weight training. No system, no machine will ever improve upon the muscle building capabilities of a simple squat performed with good form and with a conventional weight training tempo, backed by a solid diet and sufficient rest. Slow lifting and static contraction training aren’t really as far away from conventional or traditional training as they may first appear. They are simply a change, a radical change. They take the focus off the reps and onto the time you can keep your muscles under tension. Within these systems are principles that absolutely must be present for the ordinary, genetically typical person to build muscle and gain weight fast. Things such as training heavy, training intense, training for short amounts of time, training with compound exercises and, perhaps most importantly, allowing sufficient time for muscles to recover and therefore grow. It shouldn’t be that great of a surprise that these training methods can be extremely effective. Going to a slow lifting or static contraction weight training program from time to time can be the radical change the body needs to bust you through a plateau. Such a program can definitely wake a snoozing body up and make it refocus and get serious. This is how many use these systems with great success. The advocators and promoters of these weight training methods believe very strongly they are the only way to train. I disagree with this, believing instead that the types of stress presented by these methods are ultimately limiting for the person whose weight and muscle goals won’t be met in a short time, definitely limiting for the person whose goals include gaining functional strength. But I will not dispute the fact that these methods can absolutely be an effective weapon to have in your arsenal. They can also be very effective for the beginning bodybuilder. The most radical change one can make is to go from the couch to working smart in the weight room. This is the time one can see the greatest improvements in size and strength. Starting from zero, slow lifting and static contraction methods can be particularly effective due to their extreme natures, the way they demand intensity. Their short time commitments can also help the beginner stick to his weight training program. However, realize that these are intense methods of training and far from a jog in the park. While this method of weight training has been around a long time, its recent exposure is due in large part to Ken Hutchins. In the nineties, Hutchins brought his SuperSlow training methods mainstream and they have proved very successful at building muscles for the typical, non-genetically gifted weight trainer. 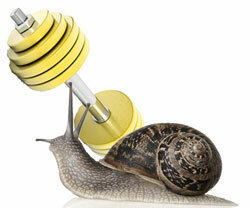 Slow lifting isn’t just slow; it is lifting done at a snail’s pace. When the time you spend per rep goes to 10 seconds and beyond, you are entering slow lifting territory. Routines performed just once or twice a week, very few bodybuilding exercises (relying on compound movements), medium weights, single reps lasting for 30 seconds or more, very short workouts and long recovery periods are some of the interesting components of a slow lifting training method. Rest assured though, that for the slow lifting training methods to be effective, you can expect the small amount of time you actually spend working your muscles to be particularly grueling. Just as slow lifting takes traditional lifting to the extreme, static contraction takes slow lifting to the extreme. Static contraction forgets about the rep altogether, requiring you to instead hold weights at various points for extended times. Whereas slow lifting has you lifting at weights that would be considered to be of medium weight, static contraction has you holding weights at your strongest points that far exceed your one rep max. Each set consists of just one hold and instead of looking to the amount of reps you do as a measure of progress, you look to the seconds you can successfully hold the weight at your strongest point, usually 10-25 seconds. Workouts are even shorter and less often than with slow lifting. Even when you’re not using slow lifting techniques, the tempo you lift with is important. Trainers who just throw weight up and down without regards to form are not the ones who get rewarded with maximum muscle gain. Slowing down and focusing on the eccentric portion of an exercise can pay big dividends. Learn more about tempo in the article, Weight Training: The Importance of Tempo.